IT’S HARD TO CHOOSE between Apple Brown Betty and Apple Bread Pudding, two desserts that combine apples with bread and spices. Both are delicious and easy to make. Both make good use of stale bread or old apples, and they are forgiving, too: the proportion of bread to apple can vary a bit depending on what you have on hand. Neither dessert stores well for long, either, but that’s rarely a problem since they are so good they won’t last. Bread and apples bake well together. The cooked bread, soaked in butter and spices, provides contrast with the apples and holds the dessert together. If you only have fresh bread on hand, leave it out for a few hours so it’s easier to cut into cubes. 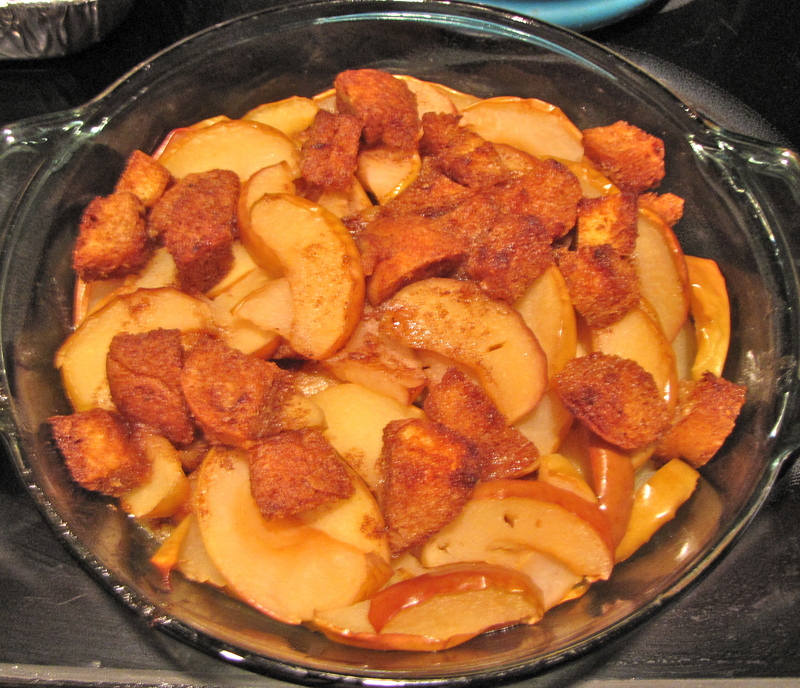 Apple Brown Betty calls for more apples than Apple Bread Pudding, and its combination of lemon juice and spices imparts a bold, lively flavor. The Apple Bread Pudding, with milk, raisins, and vanilla, is milder and sweeter tasting. Our Apple Bread Pudding is a variation of the dessert served at the March meeting of Rhode Island Fruit Growers Association at the Richmond Grange in West Kingstown. No one knows who Betty was, and the dessert’s origins are unclear. Some Apple Brown Betty recipes call for a specific bread like whole wheat or sourdough to add to its distinctive flavor. The spices, too, vary. The three used here are standard, but we have also seen recipes that substitute allspice or cardamom for the clove. Preheat oven to 350°. Grease a 2-quart baking dish. In large bowl, mix together sugar and spices. Add bread and stir. Pour in butter and lemon juice and mix until coated. Cover bottom of baking dish with 1/3 bread mixture. Layer half of apples on top. Repeat, and top with remaining bread mixture. Pour apple cider over top, cover, and bake for 30 minutes. Remove cover and bake for another 20 minutes or until apples are soft. Preheat oven to 350°. Grease 8″ x 12″ baking dish. In large bowl, mix together apples, bread, and raisins. In small saucepan over low heat, combine butter, brown sugar, and milk; heat until butter is melted, stirring occasionally. Pour over bread mixture, stir, and transfer to prepared baking dish. In small bowl or measuring cup, whisk eggs with cinnamon and vanilla, and pour over apple and bread mixture. Bake 40 to 50 minutes or until center is firm and apples are soft. FOR THE SECOND TIME in three years, New England’s apple trees are experiencing a very early bloom. Traditionally, the apple blossoms peak around Mother’s Day, or the second weekend in May. That makes this spring’s bloom roughly three weeks early, as trees have already begun flowering in some New England orchards. There’s nothing intrinsically wrong with this. The main concern for growers is that the early bloom period extends the time when the flowers and emerging fruit buds are vulnerable to frost. 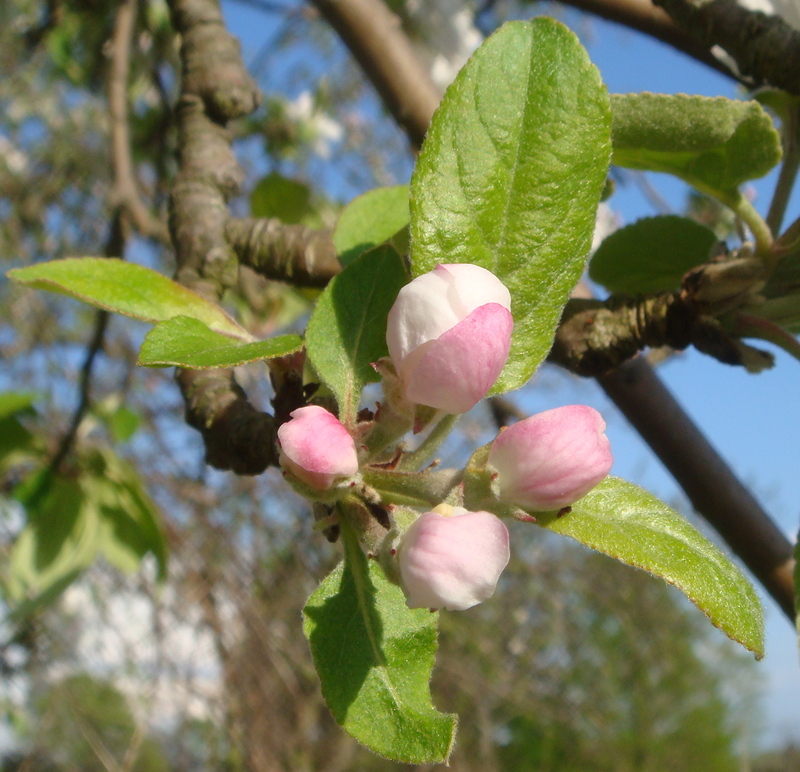 Apple blossoms can withstand temperatures in the mid-20s, but anything lower than that will kill the bud. In some places, particularly in northern New England, frost remains a risk as late as Memorial Day. In 2010, when an early April heat wave produced an even earlier bloom than this year, a May 5 snowstorm in northern Vermont destroyed some of the crop before the growing season began. An early bloom could result in an earlier harvest, too, depending on how the rest of the growing season goes; an early bloom often “catches up” to a normal harvest time over the course of the summer. So enjoy the blossoms — this is a spectacular time of year in the apple orchard — and hope that we’ve seen our last deep freeze until fall. I noticed that Blue Hills in Wallingford seems to have only 5 hives for a lot more than 5 acres, and they were all up near the owner’s house. I’ve driven past the orchards several times recently but have seen no other hives around. The hives you saw probably are kept year-round by the owners. They will be supplemented with imported hives that arrive on palettes by cover of night. The itinerant bees arrive just in time to pollinate the apples, and then they are transported to the next available crop or site. Choosing between these 2 recipes is indeed hard. I might just be making both at the same time!